Having lived in New Mexico for 10 years, and Texas for another 5 means one thing…..
It’s fresh, it’s tangy, and it goes on darn near anything. 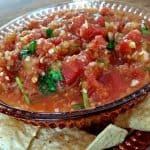 So what with Cinco de Mayo coming up, I thought I’d share with you this Super Easy Salsa Recipe that you can make at home in 10 minutes or less. It taste every bit as good as ‘that other stuff’ – you know – that stuff that’s made in New York City 🙂 (Not to mention it’s already naturally fat-free and vegan). Plus it’s super easy and inexpensive to make. You only need a few ingredients and you probably have most of them in your cupboard already. So pour yourself another Margarita and let’s make some salsa! This whole recipe can be made in your food processor. If you don’t have one, chop everything by hand and blend it in small batches to get the consistency you like. Remember, just use short pulses. If you blend this like a smoothie it will come out like soup. Maybe that’s what you like, but me personally – I like my salsa kind of chunky, not soupy. I also use canned tomatoes in this recipe. By all means use your fresh tomatoes, right off the vine, when thy come in season this summer. But for now – canned tomatoes is all we have. Be sure and drain them real good, same with the green chiles. The more liquid we add the soupier it will get. For spiciness, I used 1/4 of a fresh jalapeño. 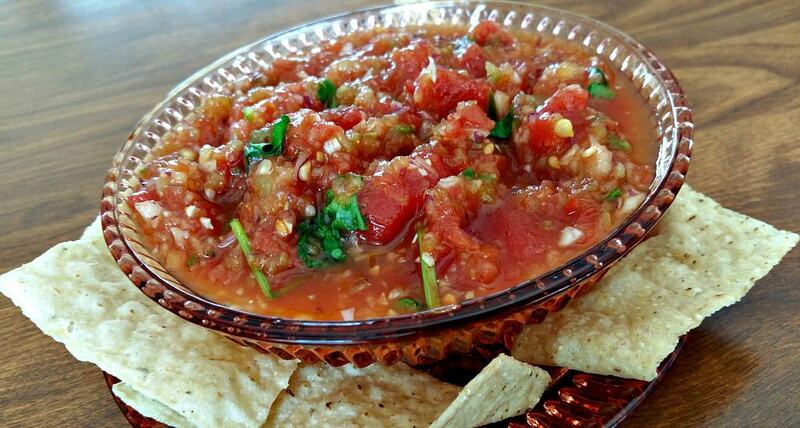 If you like your salsa to kick back at you – by all means add more. But if I did that my wife would kick back at me – so I keep it kind of tame. The Chipotle Chile Powder adds a nice flavor but is definitely optional if you can’t find it. Just use plain Chile Powder instead. And of course not everyone is a Cilantro fan. Another one of Earth’s mysteries we’ll never figure out. Use it or not – your choice – but it adds just the right amount of freshness and tang to me. I use it, just a small handful roughly chopped. A thick and chunky salsa that is naturally fat-free, preservative free, and 100% vegan that takes 10 minutes or less to make. Super fresh and super easy. Drain chiles and tomatoes well.